On Tuesday Georgia Governor Nathan Deal declared a state of emergency for North Georgia and the Metro Atlanta Region. Trucks have been coating the streets throughout the region with salt, brine, and gravel since Sunday or so in an attempt to prevent roads from icing over. Schools closed across Atlanta yesterday and today out of fear of repeating last year’s mistakes. That’s the general feeling in the air today in Atlanta: Fear. A year ago, on January 28th, I spent the morning at a café not far from Emory University (I had a gig there around noon), reading and writing, and listening to the reports roll in about the snow that would come. That quiet morning, no one was worried, no one was alarmed. Atlantans laughed it off. “Oh great, snow.” A faculty member, frustrated from sitting in his car unable to move as everyone attempted to get out of one of Emory’s parking decks, joined me at the bar and we traded news. As I looked out the window of the café, I didn’t anticipate how bad it would get. No one did. Traffic was paralyzed, with some people not able to move their cars for over two days. 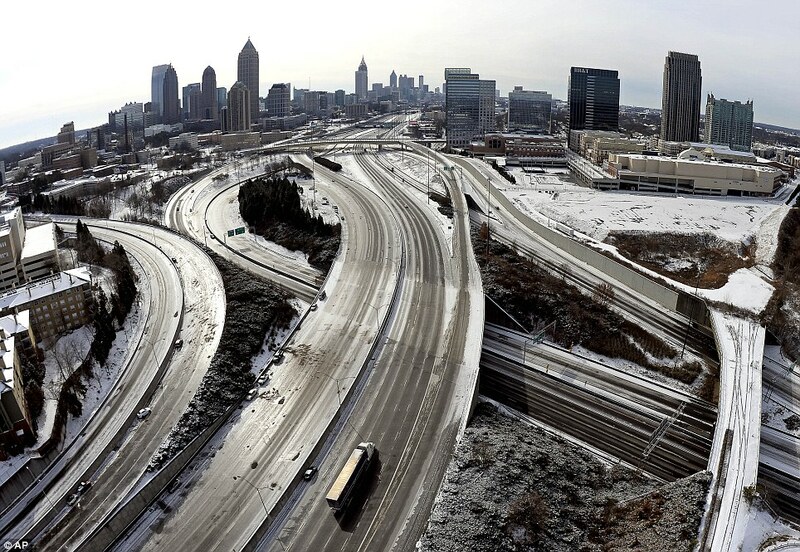 We all know how that turned out: the snow that fell first melted and formed a layer of ice on Atlanta’s untreated roads around 11:30 am, and when businesses and schools simultaneously let out at noon thousands were stuck on ice. By the time Emory dismissed at 1:00 pm, the rest of Atlanta was already ensnared in snow and the traffic that followed. Starting a little after noon, Atlanta’s reliance on roads got the better of us. The East side remained relatively clear until Emory let out at 1 pm. From my view online and out the window, I watched the cars pile up and horror stories come in on social media. The Facebook page “SnowedOutAtlanta” grew to over 50,000 members within the course of the afternoon, filling with offers from those who were at home reaching out to those stuck in their cars. People slept in their cars, trucks, stores, and pharmacies, waiting for help that wouldn’t arrive for another day. One couple even gave birth to their baby in their car. Atlanta’s leaders made national and international headlines for their poor performance and lack of foresight. Atlantans were the subjects of jokes and jabs for not being able to manage the miniscule amount of snow that fell, especially considering the Weather Channel is headquartered in Atlanta. For Atlantans, it was no laughing matter. And this year most people are taking the threat of snow much more seriously. Maybe it’s just a reflexive reaction to last year’s trauma, maybe it’s something more. Maybe this is just how Atlanta (and other Southern cities) will have to respond to snow in order to prevent our sprawling society from grinding to a halt. For those of us who live near where we work, who live in denser communities, who live near MARTA stations, life did not grind to a halt. I (and many others) walked down to the café and worked, or went to the local pizza place for dinner. MARTA’s trains continued to run and I even saw some buses braving the ice to run their routes. If Atlanta can better unite the trends of creating more places that are walkable with access to transit, Atlanta will become a fundamentally more resilient city. Not being confined to their houses would be just one of many benefits Atlantans in walkable communities would see. For those of us who already live and work in places that are relatively walkable, the snow days were not nearly as devastating as they were for those who live in the ‘burbs, and even provided a brief respite from our daily lives. This still holds true. 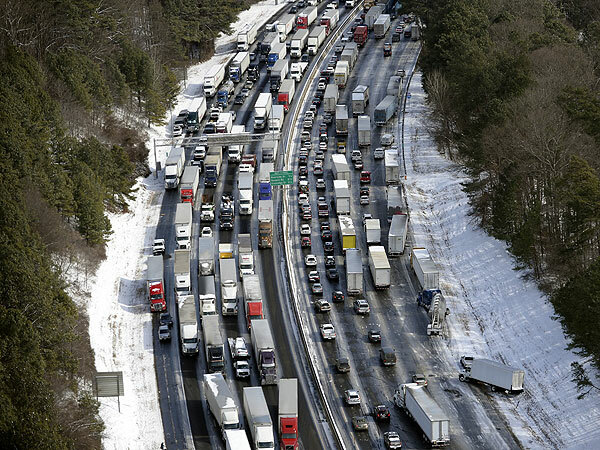 As a city and region, we can prepare for more (and more sporadic) extreme weather events, but until the people that live in this city realize the benefits of living more densely and investing in other means of transportation than just their cars, Atlanta and other suburban cities like it will continue to be crippled by even the threat of ice. This year we got lucky. As for me, I’ll be sitting in a café, waiting for the train and the snow to start falling.